A scapular is a sacramental that looks like two small pieces of wool cloth connected by string that is worn over the neck, either under or over one's clothing (typically under the clothing), such that one piece of cloth hangs over the chest, and the second piece of cloth hangs over the back (see picture below). They derive from the scapulars which make up part of monastics' religious habits -- that ankle-length (front and back), shoulder-wide, apron-like part of the habit that basically consists of a long rectangular piece of material with a hole for the head (some of them have hoods and some had ties under the arms). Monastic scapulars came, over time, to be called jugum Christi (the yoke of Christ), and receiving the scapular (becoming "invested") took on solemn meaning. Abbreviated forms of the full monastic scapulars were to be worn even at night. In addition to regular monastics of the First Order (i.e., friars) and Second Order (cloistered nuns), laity attached themselves to various religious orders, too, in what are called "Third Orders." Some lay members of Third orders -- "tertiaries" -- are "Third Order Religious" who live in a monastic community and generally take vows; most others are "Third Order Secular" who live in the world and generally make solemn promises. In the beginning, many of these lay people were invested with the full habit; later, they came to wear only the very small scapulars, as seen at left, under their clothing. In addition to these Third Orders, Confraternities of lay-people (married or single -- just "regular Catholics") developed whose members were invested with Scapulars of Religious Orders to which they were attached. It is these scapulars for lay people belonging to a Confraternity or a Third Order that one generally thinks of when one hears the word "scapular." Some scapulars have privileges and indulgences attached to wearing them, but like any sacramental (holy water, blessed candles, etc. ), scapulars are not magic; their efficacy depends on the proper intentions and faith of the wearer. Only by following through on the promises one makes when becoming invested can the benefits associated with them be had. They are best thought of as signs of a commitment to do certain things and of one's being a part of a religious community. They act as reminders, too, of these things they signify and of the Saints who are parts of the religious community in question. They are reminders to behave with holiness. The first thing you need to do is to find out if enrollment in a particular Confraternity is necessary before wearing one with the rightful expectation of spiritual benefit. This varies with the type of scapular, but most scapulars do not require any sort of enrollment that your parish priest can't handle for you. You can buy scapulars from Catholic Gift Shops, Catholic mail order catalogues, etc. They're very inexpensive, and you can also often find free ones from various places, such as the religious Order with which the desired scapular is associated or from charitable organizations and souls who make them available. Just do a Google Search for "Free Scapulars." Know, though, that free scapulars are often poorly made, are not made of wool, and are not of traditional design. It is best if you can find a traditional source for your scapulars, especially the Brown Scapular. After you get your scapular, you must have it blessed by a priest. After it's been blessed, you then become "invested" when the priest recites certain prayers (different scapulars have different prayers for investement). Many scapulars do not require investment at all, but simply need to be blessed -- as do all scapulars -- and then used properly per the directions below. Below are some of the different types of scapulars. The religious Orders they are associated with and the date of the scapular's origin appear in italics under the Scapular's popular name. 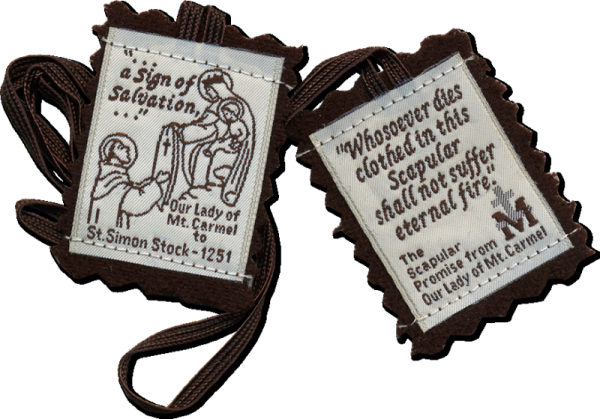 "The Brown Scapular of our Lady of Mount Carmel," associated with the Carmelite Order, is the most well-known. In A.D. 16 July 1251, Our Lady appeared to St. Simon Stock in Cambridge, England after he prayed for help for his Order. She appeared to him with the scapular and said, "Take, beloved son this scapular of thy order as a badge of my confraternity and for thee and all Carmelites a special sign of grace; whoever dies in this garment, will not suffer everlasting fire. It is the sign of salvation, a safeguard in dangers, a pledge of peace and of the covenant." departed earthly life in charity. You can be enrolled in the Confraternity of our Lady of Mount Carmel by any priest. Just obtain a scapular, take it to him to have it blessed, and express your desire for enrollment. 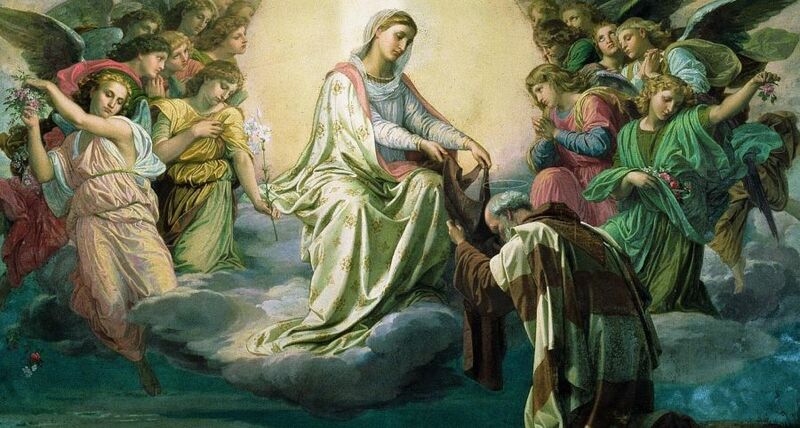 Warning: Some falsely believe that wearing the Brown Scapular offers some sort of guarantee of salvation because of the legendary words attributed to Our Lady. This is against Church teaching, is superstitious and a grave error. Sacramentals are not magical ways to manipulate God; they are Church-instituted rituals/objects that remind us of what we are supposed to be doing/thinking of, that depend on the faith, hope and love of the user, and which help prepare us to receive God's saving grace. One must do more than "wear the scapular"; one must wear it worthily. "The Blue Scapular of the Immaculate Conception" originated with the foundress of the Theatine Order of nuns, Venerable Ursula Benicasa. To her, Christ promised favor to that Order and she asked Him to extend those promises to those who associated themselves with the Order through the faithful wearing of the Scapular. The Blue Scapular is worn for the conversion of sinners. Enrollment in the Theatine Confraternity is necessary for investment with this scapular. "The Red Scapular of the Passion" came about when a Sister of Charity of St. Vincent de Paul had a vision of Christ in 1846 in which He promised an increase in the theological virtues (Faith, Hope, and Charity) of those who wore the scapular faithfully and contemplated His Passion. One side of the scapular shows Christ on the Cross, with the words, ""Holy Passion of Our Lord Jesus Christ Save us"; the other side shows the Sacred Heart of Jesus and the Immaculate Heart of His mother with the words, "Sacred Hearts of Jesus and Mary, protect us." Pope Pius IX granted the Priests of the Mission ("Lazarists") the faculty of investing the faithful with this scapular, and the Superior General of the Lazarists may allow other priests this faculty. "The Black Scapular of the Seven Dolors of Mary," or "The Our Lady of Sorrows Scapular," has on its front a depiction of Our Lady of Sorrows. Our Lady appeared to seven rich and prominent citizens of Florence who decided to give up their worldly possessions and follow Christ, promising to honor His Mother in her sorrows. Thus began the Servite Order. Mary gave them the Servite habit and said that "these garments shall be to you a perpetual memory of the sufferings of my heart." This is the more common Black Scapular. The General of the Servite Order may grant the faculty of investment with this scapular to other priests. St. Paul of the Cross, before founding the Congregation of the Passionists, received in apparitions the black habit of the order with the badge on the breast. Later, after the foundation of the congregation, the Passionist Fathers gave the faithful who wished to associate themselves more closely with their order a black scapular in honour of the Passion of Christ. "The Black Scapular of the Passion" has a replica of the emblem worn on the habits of the Passionists. It includes the words "Jesu XPI Passio" and below "sit semper in cordibus nostris." The Superior General of the Passionists may grant to other priests the faculty to bless and invest someone with this scapular. "The Scapular of the Most Blessed Trinity" is the badge of the members and tertiaries of the Confraternity of The Most Blessed Trinity. Its front depicts a red and blue Cross, and it first came about in 1193 or 1194 when a French priest, John of Matha, had a vision of an Christ and two captives, one of whom held a staff with a blue and red Cross on the top (this Cross design came to be on the habit of the Trinitarian Order). This Scapular was first used for the purposes of of increasing action to "ransom the captives" -- the Christians taken prisoner by Muslims. The Provincial of the Trinitarians and those whom he delegates may grant the faculty of investment with this scapular to other priests. If the scapular is given to an unbeliever for their conversion, the person giving the scapular prays the prayer for them if the unbeliever does not want to pray the prayer himself. If the unbeliever does not want the scapular, it may be hidden in their vicinity and the prayers said for him. Enrollment in a Confraternity is not necessary for this scapular, but the scapular should be blessed by a priest before use. A gold and violet-colored scapular with a white cord, the front shows St. Joseph holding the child Jesus in one arm and a staff of lillies on the other. Underneath are the words, "St. Joseph, patron of the Church, pray for us." On the back of the scapular are the papal crown under a dove as the symbol of the Holy Ghost. Underneath those are the Cross, the keys of Peter, and the inscription: "Spiritus Domini ductor eius" (The Spirit of the Lord is his Guide). The scapular is to remind us of St. Joseph's virtues (humility, modesty, purity); to remind us to pray to St. Joseph, asking him to pray for the Church; and to assist the dying since St. Joseph is the patron of a happy death. In addition to the above benefits, there is a plenary indulgence for those who confess, receive Holy Communion and pray for the intentions of the Holy Father on the following feast days: 25 December the day of investment of the scapular), 1 January, 6 January, 2 February, 19 March, 25 March, Easter, Feast of the Ascension, 15 August, 8 September, 8 December, 3rd Sunday after Easter and at the time of death. It is recommended also to say 5 Our Fathers, 5 Hail Marys and 5 Glorias before the Blessed Sacrament at these times. The Five-Fold Scapular is made of 5 of the following Scapulars above: first, the "The Red Scapular of the Passion," then the "The Scapular of the Most Blessed Trinity," the "The Brown Scapular of our Lady of Mount Carmel," the "The Black Scapular of the Seven Dolors of Mary," and the The Blue Scapular of the Immaculate Conception." Any priest can invest you with this scapular. For the future all the faithful already inscribed or who shall be inscribed in one or other of the real Scapulars approved by the Holy See (excepting those which are proper to the Third Orders) by what is known as regular enrollment may, instead of the cloth scapulars, one or several, wear on their persons, either round the neck or otherwise, provided it be in a becoming manner, a single medal of metal, through which, by the observance of laws laid down for each scapular, they shall be enabled to share in and gain all the spiritual favors (not excepting what is known as the Sabbatine Privilege of the Scapular of Our Lady of Mount Carmel), and all the privileges attached to each. 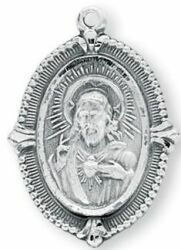 The right side of this medal must show the image of Our Most Holy Redeemer, Jesus Christ, showing His Sacred Heart, and the obverse that of the Most Blessed Virgin Mary. It must be blessed with a separate blessing for each of the scapulars in which the person has been enrolled and for which the wearer wishes it to suffice. Finally, these separate blessings may be given by a single sign of the cross (unico crucis signo), whether in the act of enrollment or later at the convenience of those enrolled, it matters not how long after the enrollment or in what order they may have taken place; the blessing may be given by a priest other than the one who made the enrollment, as long as he possesses the faculty, ordinary, or delegated, of blessing the different scapulars- the limitations, clauses, and conditions attached to the faculty he uses still holding their force. All things to the contrary, even those calling for special mention, notwithstanding"